With just a few days to go, confirmations are still coming in from candidates across the country as we prepare for our next Discovery Day this Friday, August 11th. Every month we receive dozens of franchise inquires about our sports pub / restaurant opportunity with most people going through the vetting process that includes an application, financial review and background check as well as target market alignment. 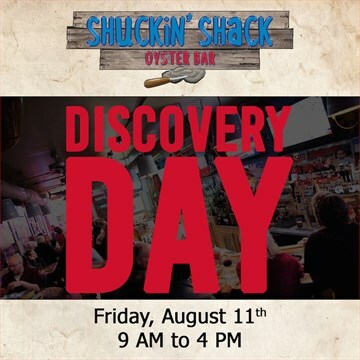 For the top candidates who have an interest in expanding into our future target markets, we schedule a special full-day event, called a Discovery Day, that presents them with the entire Shuckin' Shack Oyster Bar experience! In the interest of time and appropriate candidate attention, we allow no more than five groups to participate within a single day event. Beyond being introduced to our entire support team, qualified franchise candidates also meet our CEO, Jonathan Weathington, and our co-founder, Matt Piccinin. Attendees also experience the original Shuckin' Shack Oyster Bar location, opened 10 years ago, as well as our Downtown Wilmington, NC location and a visit to our headquarter offices, also in Carolina Beach. The full day event usually concludes with a tasting menu that includes many of the signature dishes from "The Shack" for everyone to sample. If you have been considering opening a restaurant or sports pub of your own within the southeastern states we are targeting for expansion in 2018, get started today and discover the many benefits of the Shuckin' Shack Oyster Bar franchise and take part in a future Discovery Day event!